“a Lamp to my feet. a Light for my path.” – Micah 6:8 | A LAMP TO MY FEET. A LIGHT FOR MY PATH. 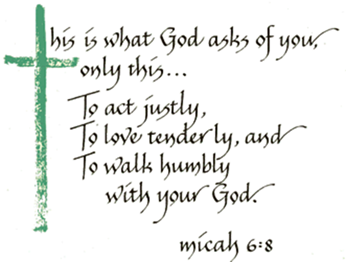 to act justly, to love tenderly and to walk humbly with your God. is not only a matter of formal worship. practicing justice and charity towards one’s neighbour. do we truly follow what the Lord asks of us? almost ignoring all that does not produce an immediate and tangible return? or do I only reserve some time for Him on Sundays? is my general attitude a humble one? …but do I follow it? Lord God, make me truly humble, loving and just. Amen.